The best graduating student of the Osun State University, Osogbo, Mr. Mubarak Opeyemi Thanni, has disclosed that he sacrificed his social life throughout his undergraduate days in order to come out with the best grades. 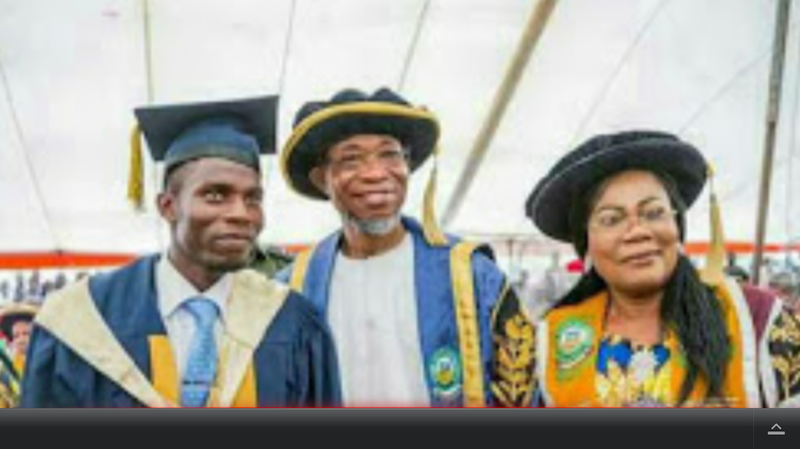 Speaking with Amiloaded at the 6th Convocation ceremony of the university, in Osogbo, Thanni, who studied Civil Engineering, became the cynosure of all eyes at the well-attended event, when he was announced as the best graduating student of the 2016/2017 set with 4.77 Cumulative Grade Point Average. Thanni, while speaking on his success story, said that he never knew he could be the best student, adding that whenever he got B in any of his courses, he always felt as if he had failed the course. Advising undergraduates to always go for the best and nothing less, Thanni also urged them to endeavour to sacrifice the fleeting enjoyment of social life, which he said would only distract them from emerging the best. He said, “First the secret of my success is Almighty Allah. Two, dedication. Three, my family. Four, my colleagues and five, my illustrious lecturers. “I said God because I never knew I would make a first class until the penultimate year (fourth year), and of course, I never thought I would be the Best Graduating Student with 4.77 Cumulative Grade Point Average. It is a surprise to me, too. “Two, it is dedication because the academic pursuit took away my social life. It is either A or nothing else. Whenever I got B, it’s as if I had failed the course. "This is also not unconnected with the promise I made to my parents after my immediate elder brother, who was then a student of the Lagos State University, was killed by a stray bullet from a police officer in Lagos while he was returning from a bursary exercise. I was in SS3 then and I told my parents I would try my best to make up for the loss as much I could. “Three, it is my parents because they never doubted me and were always there to provide me with whatever was needed. Four, my colleagues with whom we used to do tutorials together. I taught them just as they taught me. The relationship was mutually beneficial. When I got to this school, I was lucky to meet great people. Some of them are my first roommate, Abdullah Lookman; Iyiola Akanji, Tijani Akanji, among others. When asked about his future, Mubarak said he would like to follow in the footsteps of his mentor, Dr. Olawale, who is a structural engineer and researcher per excellence.